Contacted by the Hirshhorn Museum in Washington, DC., Dolphin Press & Print was invited to create a special edition print responding to the exhibition Salvatore Scarpitta Traveler. This exhibit (curated by Melissa Ho of the Hirshhorn Museum) is on view through January 11, 2015. Bryn Freeman, an alumna of Maryland Institute College of Art (graphic design '04), was selected to make this limited edition print. With the help of MICA students, Ms. Freeman's screen print Traveler was published at Dolphin Press & Print in Fall 2014. Freeman’s passion for cars and eclectic design sensibilities made her a perfect choice to commemorate Scarpitta's work. Her past projects include poster designs for film festivals at The Doris Duke Theatre at the Honolulu Museum of Art; promotions for events at the Creative Alliance; and design of the 192 page book Playing with Sketches for Rockport Publishing. 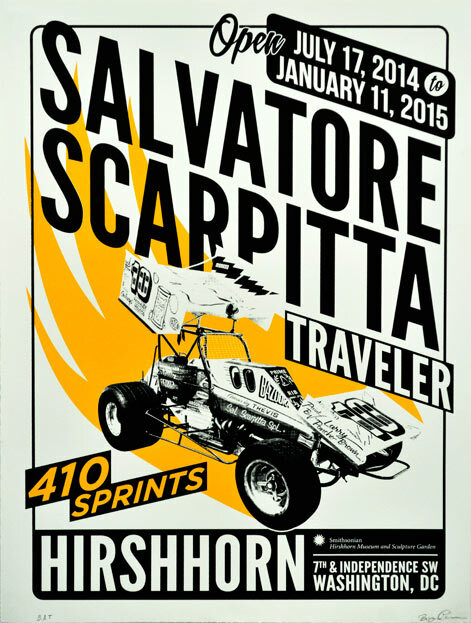 Traveler was inspired by vintage 1- and 2-color sprint car [and motorcycle] race posters. The yellow color was taken from the paint and Monroe suspension on the Trevis car.